One of my most requested shots is the black background image. 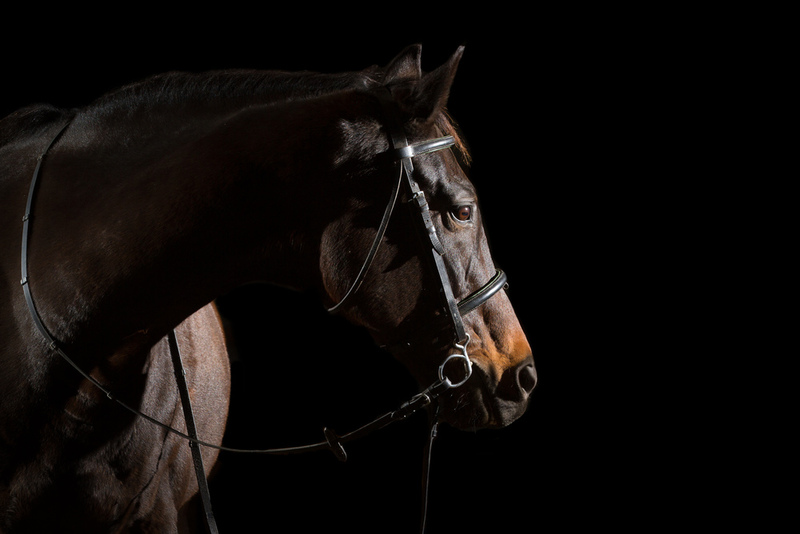 These are beautiful, dramatic and focused completely on the horse. In this blog entry, I will talk about the two ways I photograph these types of images, with samples of both. The beauty of these images is in their simplicity. You can shoot them with natural light or with flash (speedlights or strobes). 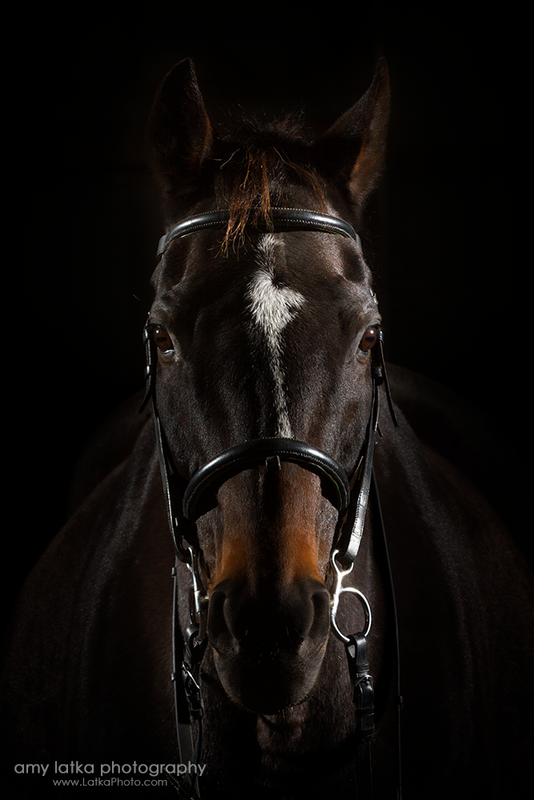 An example of a black background created in a barn door setting with natural light. An arena entrance or barn aisle entrance where you can easily open or close the barn door as desired. Preferably a space where you can close the doors at the far end. So if its an aisle, close the door at the end of the aisle. Bright INDIRECT lighting. 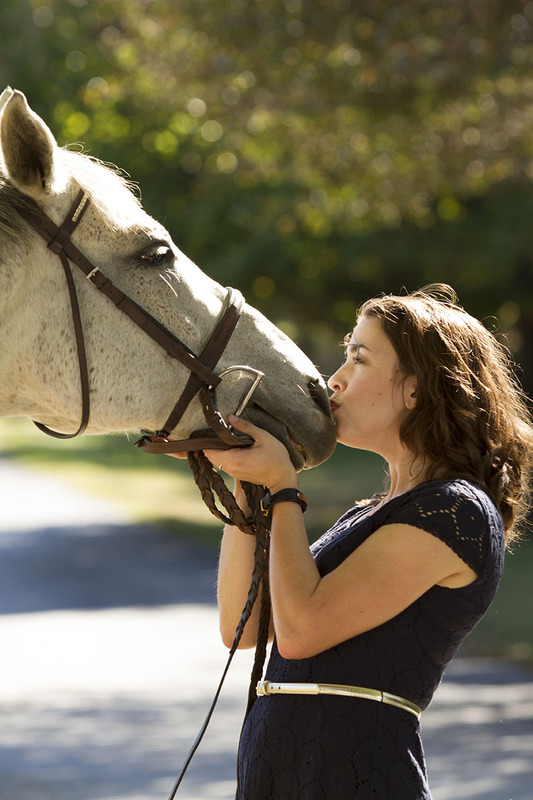 If you have direct, bright sunlight on the horse, you are much more likely to have exposure issues. Indirect light is your friend. 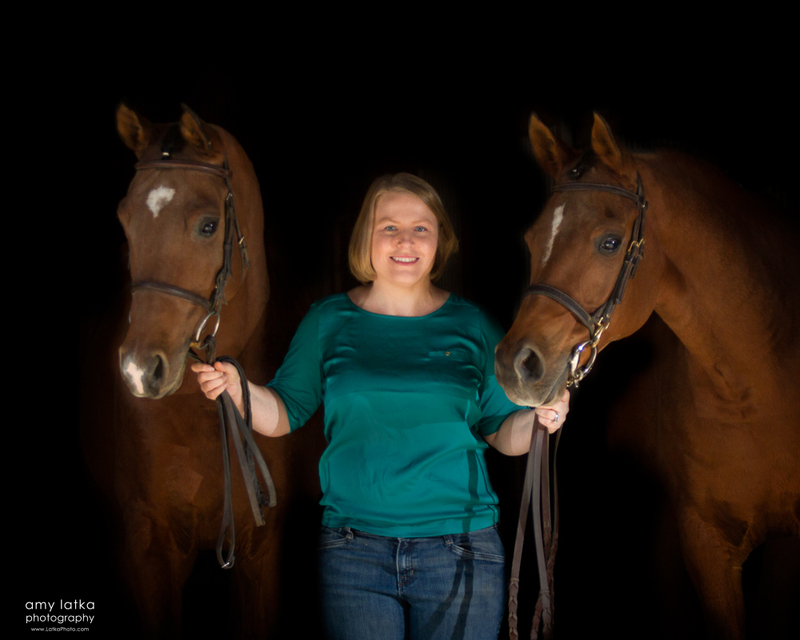 If you do have direct sunlight coming in, simply have the client move back so that they are standing in the shadows and don't have direct sunlight on themselves or their horse. A camera body that allows you to manually control the settings. A tripod is not required, but can be handy. Especially if you don't have an assistant to help you maneuver the horse/handler into the position you want. If you're not going to use a tripod, then a monopod is highly recommended to help stabilize the camera. Oh yeah...and a horse and handler. The key to this type of photography is to understanding the relationship between light, shutter speed, aperture and ISO. As well as how aperture relates to depth of field. I see a lot of people who want to shoot at a f-stop of f/2 or lower. For these barn door shots, its rarely necessary to shoot with that shallow of a depth of field. 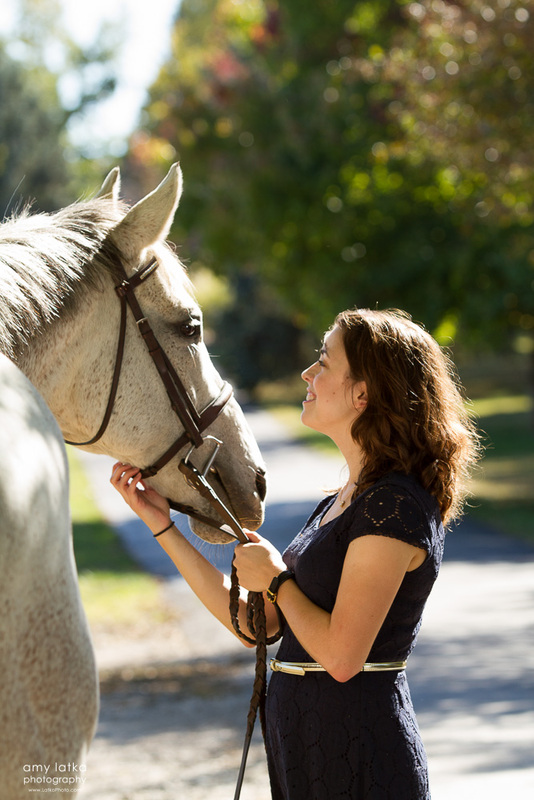 In fact, unless you're going for a really artsy shot, you want to make sure that BOTH of the horse's eyes are in focus. And if you have a person in there too, you want their eyes in focus as well. This means, you have to up your f-stop to something like f/5. This is going to create the depth of field to allow the horse's entire head and the handler's head to be in the focal plane. BUT, there is also a side effect to this! The larger that f-number, the less light is going to be hitting your sensor. What does that mean? It means that your dark areas are going to show up as darker. If you're not familiar with the Exposure Triangle, learn it. Step 1: Time for the first part of our shoot: killing the ambient. You're standing in front of the empty barn door. You want a blank canvas -- a dark hole -- in front of you. Its time to play with your camera and find out where the interior becomes dark. In other words, we want to kill the ambient light INSIDE the barn. I usually start with these settings and make adjustments from there. Take a picture with these settings from where you'll be standing. Shoot into the barn door. Ask yourself "Is my resulting image too bright? It is black? Can I see any detail?" Once you find where black is, make a note of it. Since sunlight changes throughout the day AND affects your ambient, you may have to make some slight adjustments depending upon how long you'll be shooting in this space. Step 2: The second part of this setup is to now add your subject. Put the horse and handler at the entrance of the doorway -- so that they are framed in the barn door -- and do a test shot with the settings you found during Step 1. Again, look at the image you created. Is it too dark? Is it too bright? Is there direct sunlight on my subjects? Do I like the direct light? Are they too dark? What happens when I adjust my ISO/shutter speed/aperture? Do I like that change? What if the horse/handler are too dark (underexposed)? You can always bring them further out of the aisle or barn door. Remember, we're not killing the sunlight OUTSIDE the barn, so if you bring them out in front of the barn door, you'll have ambient light to light them, while the backdrop (the aisle) is still black. If you're patient, you should be able to find your sweet spot -- the location half-in/half-out of the barn door where the exposure on the front of the horse is good and the ambient light drops off to black as the back of the horse goes into the barn. This is your sweet spot. What about PhotoShop? Remember, you may need to do some post processing of your images to help darken it to black. But the closer you can get to making your image IN CAMERA, the easier this process is over all AND the more natural it looks when viewed later. We don't want to see harsh lines where the horse looks cut out and placed on black. Learning to read the light and make your adjustments in camera is going to help increase the quality of the final image while decreasing your post-processing workflow. Win-Win! But...but...what if its cold and rainy on the day of your shoot and you can't stand outside? What then? If you have speedlights or strobes and triggers for using them off-camera, you're set. This image was created using two speedlites with a wireless trigger system. When I learned how to use wireless flashes, it made me impatient with natural light. You see, learning to control and create light meant that I wasn't dependent upon the position of the sun in the sky. And therefore, it became much easier to create the light that I wanted to create, when ever and where ever I wanted to create it. This includes the horse barn. Another two-light shot. One on each side of the horse. One assistant...oh wait...just me. An assistant/horse handler would have been very helpful! There is only one real rule for shooting with this setup and that is that you have to know how to stop your camera down to kill the ambient light. And since we discussed that in the first part above, you're golden! Same rules apply. So that's pretty simple, right? Next is setting up your lights. I'm going to go out on a limb and assume that you are familiar with how to use your flash in manual mode AND that you have whatever necessary equipment you need/want/choose to use to shoot OCF (Off Camera Flash). The cool part about using lights, especially speedlights on stands, is that they are so very portable. They're easy to move about and carry with you on location. You can also raise/lower them to light different aspect of your subject. How did I set up the flashes to get the shot I got? Well, first, let me say that there are no rules. You can put them where ever you want in relation to each other. If if you think of a clock with your subject (horse, person, whatever) in the center where the hands converge, then you have the entire circle around them to place the lights. 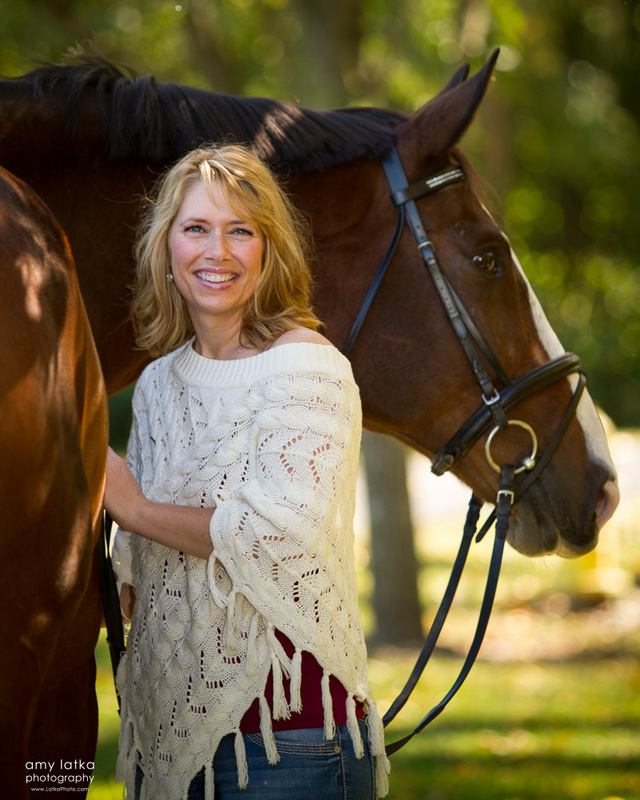 For the shot above, the key light (the primary light) was camera right at about the 3 o'clock position to the horse. Then, I had a second light camera left at about the 10 o'clock position. Here is a pull back image so that you can see. Here you can see not only the placement of the lights, but also the ambient light in the barn. There was quite a bit of ambient, but by stopping down the aperture, we can make it appear black, with only the lights from our speedlights to light our subject. Don't get caught up in the horse facing away from me. Again, the beauty of this is that you can set up your subject however you want. If you wanted the light behind them, you could also do that. It really just depends upon what you want to create. Here is another shot that had the lights at 9 o'clock and 12 o'clock in relation to the horse. A couple things to note with this setup. 1) The light in front of the horse is turned long way since the horse is tall and I wanted to light the front of it. 2) The light behind the horse was lowered to create the rim-light affect in the top image. Questions? Let me know! Leave a comment below. My number one suggestion is just to go out and play. I do recommend having an assistant to hold the horse. But most importantly, go out and play with your equipment. Learn what you can create and where you might be limited by your current equipment. Think about what you want to create and try to create it. Maybe you have a vision for what you want to create. Maybe you just want to see if you can get your OCF to work or you want to figure out how to stop down your aperture. Just go with a goal in mind and have fun doing it! And don't forget to put a link to your images in the comments below. I would love to see the black ground images you're creating with horses! In late September 2011, I was contacted by a gentleman who was interested in purchasing a portrait session as a gift for his wife. 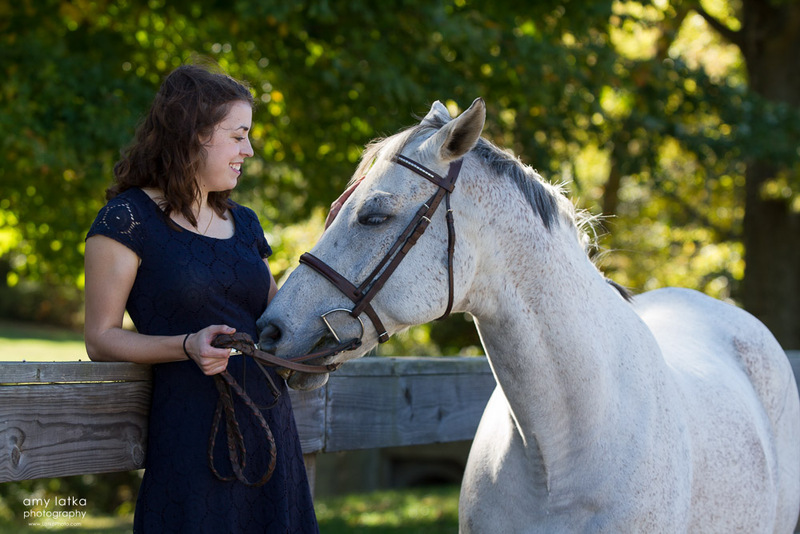 She had a new horse and they wanted portraits done of both the horse and their family. 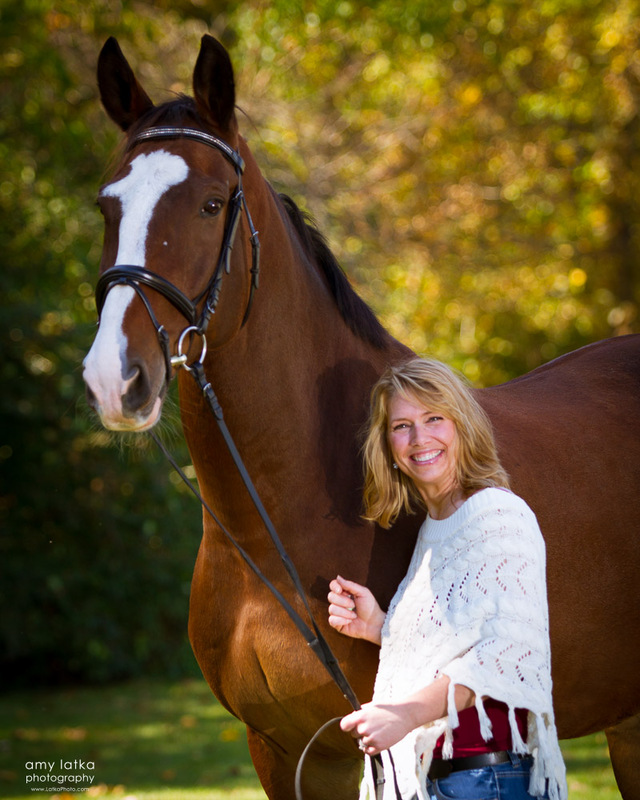 And so it was that met Dana C., owner of Ralph, a beautiful bay Arabian gelding. 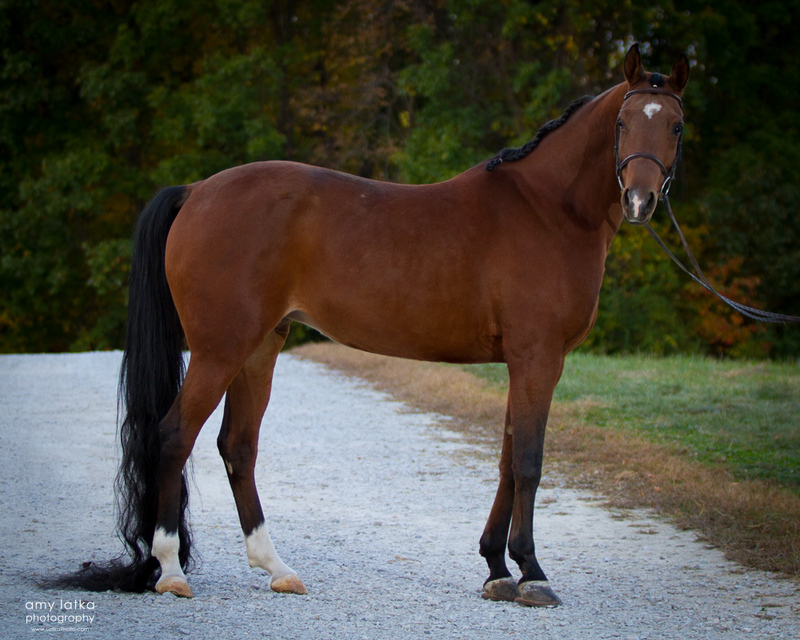 Fast forward to last year, when Dana purchased a second horse, another bay Arabian, but this time, a mare. Like the supermodel whose name she shares, Giselle is a looker! She has all of the beautiful attributes of a nice Arabian. Dana's husband contacted me again for another portrait session as a gift. They were in need of portraits with Giselle. I was happy to oblige. Special thanks go out to Dana and Brooke Coffee of Hill View Arabians for their help preparing and handling horses during this session. It always nice to have extra hands. We all have those friends that we don't see very often, but that we just pick right back up with as soon as we are together. Bridgette P. is one of those friends for me. Though I don't see her often, whenever I do see her smiling face, I know that laughter and good times are not far away. 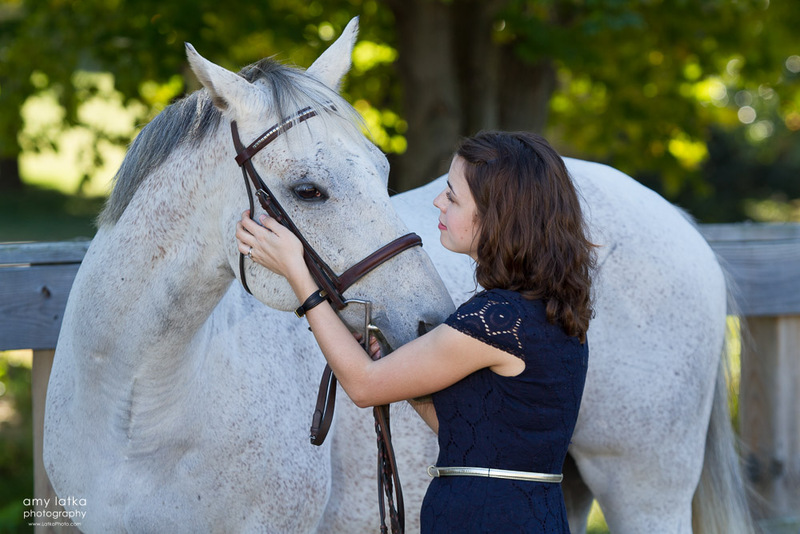 We met many years ago at a horse show where she was competing and I was the official photographer, and something just clicked. I think we're of the same tribe. And so it was especially nice to receive a request from Bridgette for a portrait session. 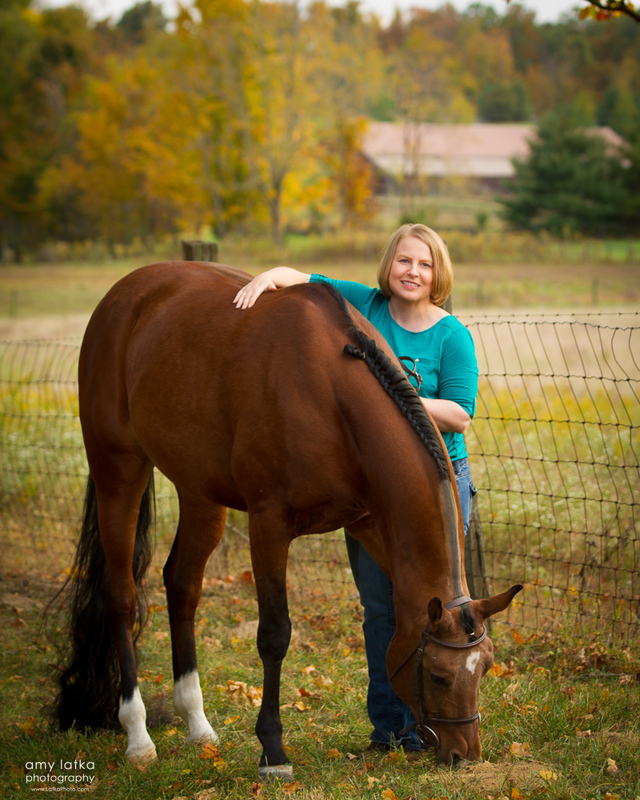 She was the organizer and coordinator of the Travis Creek Farm mini-sessions I shot back in October. 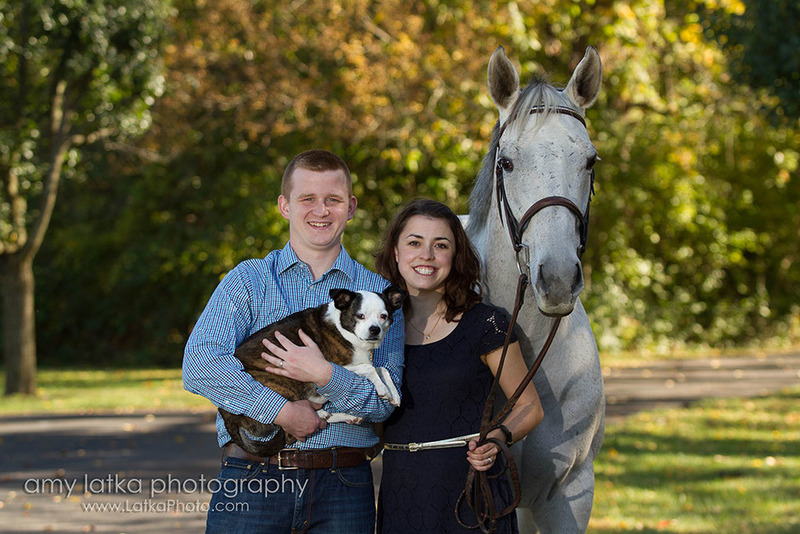 I jumped at the chance to not only photograph her with her new dressage mount, Hank, but also with her beautiful family.